Another month, another new Oreo flavor. S’mores anyone? Another new flavor of Oreo arrives on store shelves and this time, I didn’t take months to post my review of them. Just 1 month. 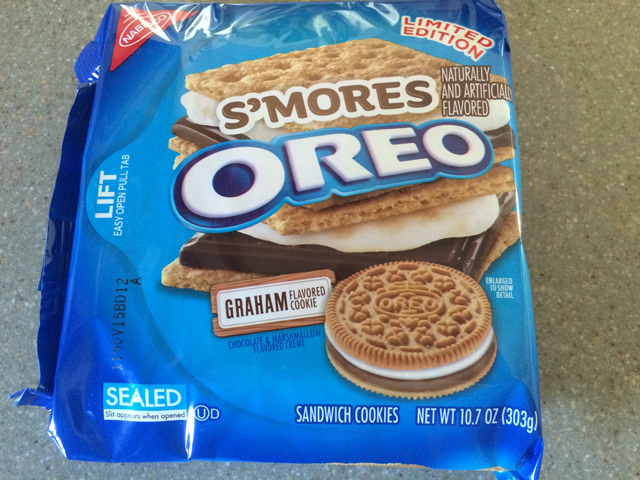 They are S’Mores flavored Oreos and they are pretty tasty. As with just about any of these limited flavors, the package is smaller than a regular package of Oreos: 10.7 oz compared to the regular Oreos at 14.3 oz. Which means you get less cookies. So you tend to eat them faster. 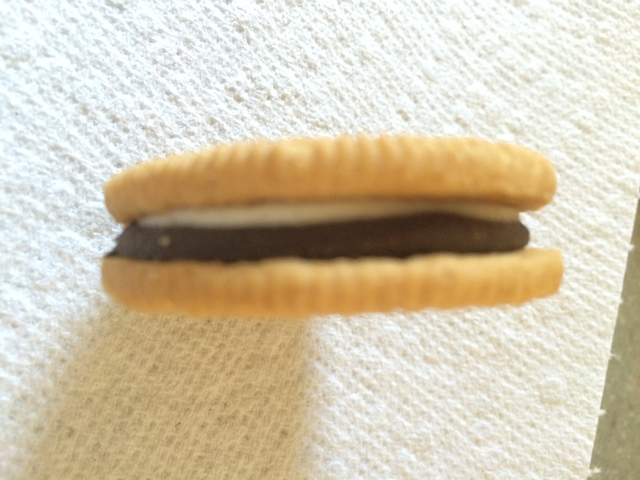 And these S’mores Oreos went pretty quick. I did share a few with others, and they agreed this flavored cookie was pretty good. 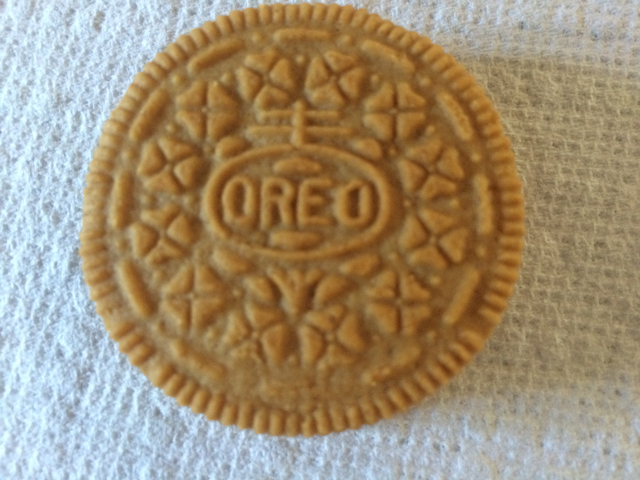 The cookie itself is graham cracker flavored and it’s the part of the cookie that is deemed “Naturally flavored”, as the package mentions in the upper right hand corner. The filling is mixed, as you can see from the side view of the cream filling. More to simulate the chocolate and marshmallow flavors that are mixed together. I would guess that the inside filling is the “Artificially flavored” part of this cookie. 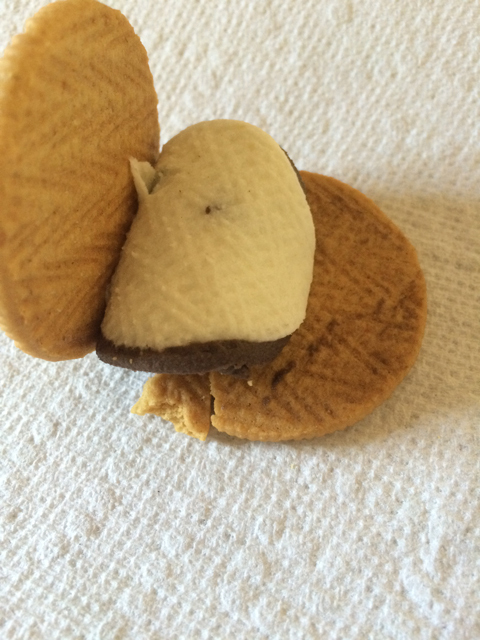 When I pulled the cookie apart, you can see the cream filling mixture in more detail. Eating just the cream filling off the cookie, it was pretty authentic to tasting like eating the middle of a campfire-made S’more, just cold and not melted. If these came back, I would try them again. Pretty good for a limited edition Oreo. I liked these too! We had them the same night we had real s’mores and it wasn’t overkill! Ha ha! Oh cool. I was hoping you had tried them. Nice to combine real S’mores with Oreo S’mores. We had these about a month ago. Not bad at all.